Dog Boy Knives is committed to recycling and repurposing. 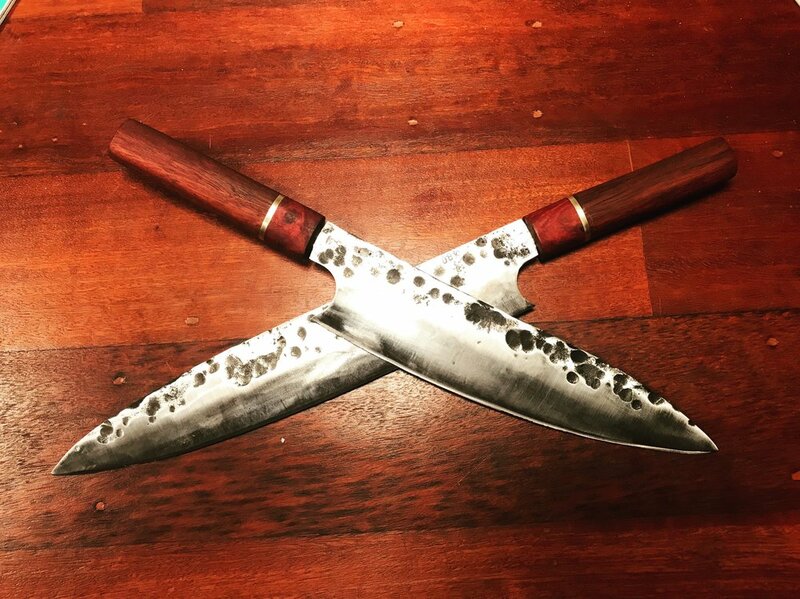 Working together with chefs and cooks to forge a unique custom knife is a passion. Bespoke chef knives for an Adelaide chef. You've seen a knife you like but can't find it in a shop… a favourite knife has worn out and you would like something similar. DBK can help design and make the knife you would like from recycled materials. Or, I can help you bring your own design to life in a bespoke piece. Happy to talk through your wishes. A knife made with my son using Mulga wood we found on a camping trip. Do you have a piece of timber you would like made into a knife handle? Or your grandfather's old file? DBK can repurpose a historical or emotionally significant item into tomorrow's heirloom. I would love to hear from you to see what we can create. Repairing an heirloom. A grandparent's carving knife with its new jarrah handle. A snapped tip. A broken handle. A neglected old blade in need of some love. DBK can help to rejuvenate your old knives. #reuse, recycle, repair, repurpose, respect. Please contact me for details.